My first batch of monarchs may be historically late, but most are thriving as they approach butterhood. Here are some of the highlights through mid-July. I’m happy the American ladies (Vanessa virginiensis) are finally too large to shut themselves in an inglorious ‘safe house’ made of frass (poop) and silk…gross! 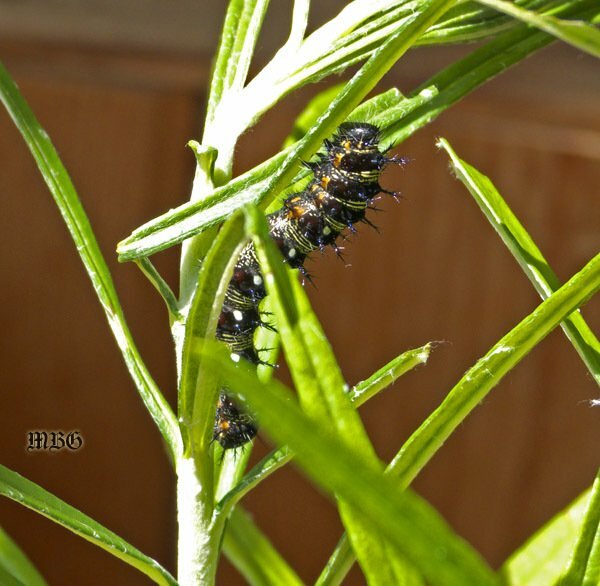 Using pearly everlasting cuttings is my preference for raising American painted lady butterflies. This process couldn’t have been easier. As I’m writing this, a monarch female just fluttered by the window. Looks like the 2013 season may be gaining some momentum! My 2016 milkweed started coming up. It gets about an inch to five inches high then wilts back. This has happened repeatedly. I have, Swamp, Cinderella and Rose that this keeps happening to. We just saw our first Monarch today 6/11. So worried that we wont have enough milkweed. What could be happening to the milkweed? It was beautiful last year. I live in South Georgia, and my milk weed was just planted this spring, so they are not very tall. I also have 5 butterfly bushes in different locations, adjacent to my 2 milkweed gardens. I really do ‘t expect butterflies this year but will keep,in touch to help the caterpillars to survived etc. I expect to,expand my gardens next spring. Thank you for your expert advice, am looking forward to butterflies visiting. When my gardens and bushes are fully mature, when would I expect butterflies, do they migrate down this way? Hi Gerald, you would most likely see monarchs during the spring and fall migrations. The exact time will vary depending on weather patterns. it sounds like they will have good reason to visit you in the coming seasons…good luck! Thanks for sharing all of your news. I appreciate your American Painted Lady comments, as I have seen the webbing on my Pearly Everlasting, as well. Do you raise those too? I have only watched those plants change in my garden, but I’ve not seen any cats: just the frass and webbed leaves. I can’t really tell if there are cats inside but have left them alone. Yesterday I saw a swallowtail pass through our yard, but she didn’t stay long enough for a good look. I’m hoping for a Giant in IL and have hope since you’ve seen them in MN! It’s always good to hear your northern news, for those of us south of you. It means we all should be seeing something by now! I had my first monarch and just one egg (butterfly weed) this week. It’s not their preferred option, but in my small yard and HOA controlled neighborhood, it’s really the best option. I keep hoping to find another shortish milkweed option that might work well here. I appreciate your photos, too! It’s great seeing gardens of those who are doing this all really well. Happy Butterfly Gardening, to all! Hi Carol, thanks for your comments. We don’t usually raise painted ladies, but it’s easy to put a pearly everlasting cutting in a floral tube and we have raised them successfully a few times. I hear Asclepias perennis stays pretty short and is a good garden plant. We have two plants from last season, and I’ll report more on those this summer…already found an egg on one. Tropical milkweed is also a great annual for attracting monarchs in northern regions. Thanks for the feedback, Tony! Honestly, I’ve not seen Asclepsias Perennis. Hmmm! Onward to the net search! 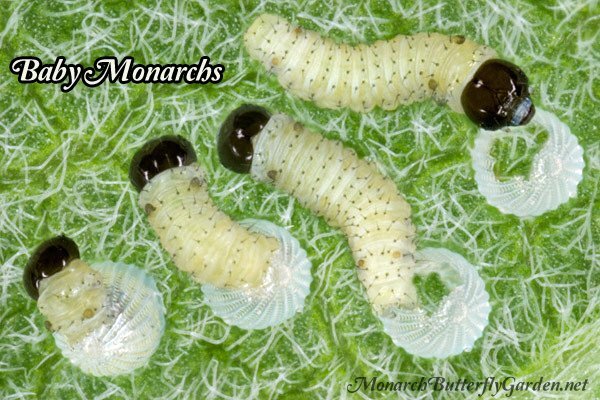 The first picture here isn’t like the baby monarchs I raised, are these another variety? Just wondering…..
Hi Barb, those are new hatchlings. That’s what they look like before the stripes start to appear…this is macro photography. We have 7 monarchs raised and released so far. When should we expect the next group and how many groups before the last one that flies to Mexico? We live in Kansas. Hi Nancy, you can potentially see eggs/butterflies all summer long through the migration. We are starting off this season much better than 2016, so I suspect many regions across the eastern half of the US and Canada will see more monarch activity.